BURBANK, CA (February 22, 2013) - A destructive force is devastating planets across the galaxy - with Earth next in its sights - and even Superman may not be capable of halting the terror in Superman: Unbound , the next entry in the ongoing series of DC Universe Animated Original Movies. Produced by Warner Premiere, DC Entertainment and Warner Bros. Animation, the all-new, PG-13 rated film arrives May 7, 2013 from Warner Bros. Home Entertainment as a Blu-ray(TM) Combo Pack ($24.98 SRP) and DVD ($19.98 SRP), On Demand and for Digital Download. The Blu-ray(TM) Combo Pack will include UltraViolet(TM)*. Based on the Geoff Johns/Gary Frank 2008 release "Superman: Brainiac," Superman: Unbound finds the Man of Steel aptly handling day-to-day crime while helping acclimate Supergirl to Earth's customs and managing Lois Lane's expectations for their relationship. Personal issues take a back seat, however, when the horrific force responsible for the destruction of Krypton - Brainiac - begins his descent upon Earth. Brainiac has crossed the universe, collecting cities from interesting planets - including Supergirl's home city of Kandor - and now the all-knowing, ever-improving android has his sights fixed on Metropolis. Superman must summon all of his physical and intellectual resources to protect his city, the love of his life and his newly-arrived cousin. The film's stellar voicecast is led by Matt Bomer (White Collar) as Superman, John Noble (Fringe, The Lord of the Rings films) as Brainiac, Stana Katic (Castle) as Lois Lane and Molly Quinn (Castle) as Supergirl. Additional voices in the cast include Golden Globe winner Frances Conroy (Six Feet Under) as Ma Kent, Wade Williams (The Dark Knight Rises) as Perry White, Diedrich Bader (Batman: The Brave and the Bold) as Steve Lombard, Stephen Root (Boardwalk Empire, Justified) as Zor-El, and Alexander Gould (Weeds) as Jimmy Olsen. "Superman: Unbound adds an all-new chapter to the growing legacy of animated films featuring the Man of Steel and his epic challenges to maintain peace on Earth," said Mary Ellen Thomas, Warner Home Video Vice President, Family & Animation and Partner Brands Marketing. "Matt Bomer's voice epitomizes the All-American hero that is Superman, and John Noble counters that tone with a commanding, chilling delivery for Brainiac. A superhero is only as good as the depths of his opposition, and Noble brings out the best in his villainous portrayal of Brainiac." * Featurette - "Kandor: History of the Bottle City" - An all-new featurette. Kandor: a peaceful scientific community dedicated toward the preservation of all that is good on Krypton, the home world of Superman. That is, until the city was ripped from its world and placed into a small glass bottle! This is the short story highlighting the shrunken city of Kandor. Its history just as fascinating as it is unique, here is how it ties in directly with the Man of Tomorrow. * Featurette - "Brainiac: Technology and Terror" - An all-new featurette. Mostly machine, but part sentient being, Brainiac steals cities, and destroys worlds. Is he the most vile of Superman's villainous foes? Experience the Brainiac mythology and find out why Superman barely stands a chance! * Four bonus episodes from Superman: The Animated Series ("The Last Son of Krypton, Part 1"; "New Kids in Town"; and "Little Girl Lost, Parts 1 & 2"), all handpicked by producer Alan Burnett. *	Digital Comic - Excerpt from the graphic novel Superman: Brainiac by Geoff Johns and Gary Frank. 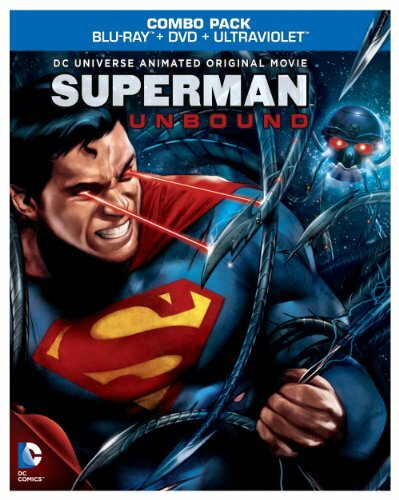 * Superman: Unbound UltraViolet offer is a limited time offer. Restrictions and limitations apply. Go to ultraviolet.flixster .com/info for details. DC Entertainment, home to iconic brands DC Comics (Superman, Batman, Green Lantern, Wonder Woman, The Flash), Vertigo (Sandman, Fables) and MAD, is the creative division charged with strategically integrating its content across Warner Bros. Entertainment and Time Warner. DC Entertainment works in concert with many key Warner Bros. divisions to unleash its stories and characters across all media, including but not limited to film, television, consumer products, home entertainment and interactive games. Publishing thousands of comic books, graphic novels and magazines each year, DC Entertainment is the largest English-language publisher of comics in the world. In January 2012, DC Entertainment, in collaboration with Warner Bros. and Time Warner divisions, launched We Can Be Heroes--a giving campaign featuring the iconic Justice League super heroes--to raise awareness and funds to fight the hunger crisis in the Horn of Africa. Warner Bros. Animation (WBA) is one of the leading producers of animation in the entertainment industry, with an innovative and talent-rich roster boasting some of the most accomplished writers, producers and artists working today. The studio is on the cutting edge of animation technology and has both CG and traditionally animated projects in current production and development. For TV, WBA produces series such as Green Lantern: The Animated Series, The Looney Tunes Show, MAD, Scooby-Doo! Mystery Incorporated and Young Justice: Invasion, as well as the forthcoming Beware The Batman, Teen Titans Go! and The Tom and Jerry Show for Cartoon Network. WBA also produces series and additional original content -- including animated shorts -- for Cartoon Network's multiplatform branded DC Nation programming block. In addition to TV programming, WBA produces theatrically released CG cartoon shorts featuring iconic Looney Tunes characters, rendered in stereoscopic 3D. WBA also creates the highly successful series of DC Universe Original Animated Movies for DVD. Producing for multiple platforms including TV, digital and home entertainment both domestically and internationally, WBA is highly respected for its creative and technical excellence, as well as for maintaining the Studio's rich cartoon heritage. It is also the home of the iconic animated characters from the DC Comics, Hanna-Barbera, MGM and Looney Tunes libraries. One of the most-honored animation studios in history, WBA has been honored with six Academy Awards(R), 35 Emmy(R) Awards, the George Foster Peabody Award, an Environmental Media Award, a Parents' Choice Award, the HUMANITAS Prize, two Prism Awards and 20 Annie Awards (honoring excellence in animation).